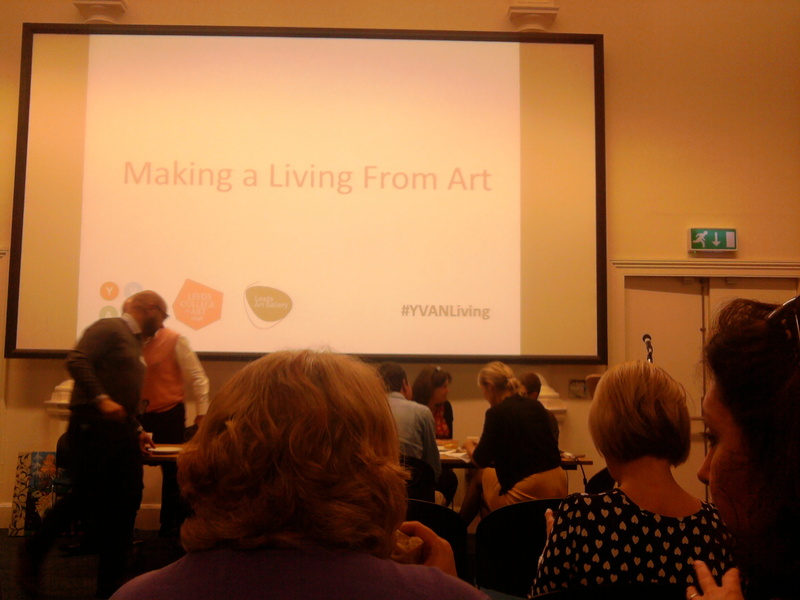 On Friday I attended an all day seminar on ‘How to Make a Living from Art’ held at Leeds Art Gallery and organised by Yorkshire & Humber Visual Arts Network. It was an amazing event, and a real privilege to be there. On the Saltaire platform waiting for the Leeds train I bumped into Sarah Harris of Sarah Harris Prints heading to the same event and already seated at the event was Otley based artist Lorain Behrens and some friends of hers. Lorain was instrumental to me when I was starting out, very supportive and writing about me and showing my work, so it was great to see her. I’m part of Craft Soup, a Facebook Group for designer/makers who run businesses in Yorkshire and as inevitably happens at these type of events a bit of a Soupy corner began to develop. We were faced with a packed programme of speakers. 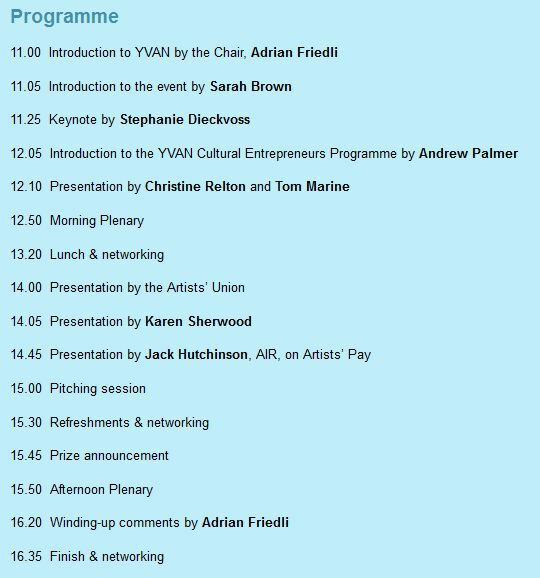 The event was filmed and will be uploaded onto the YVAN website and I urge you to have a watch. For me the highlights included Stephanie Dieckvoss’s keynote speech which busted some of the clichés and myths around what it takes to become a successful artist including the centrality of London, the need for independent wealth, and knowing the right people. She also had a list of top tips including the importance of working hard, taking opportunities when they arise, going outside your comfort zone, standing up when you’re down, the importance of being able to communicate, knowing what your story is, know yourself and be realistic about what you are good at, know your market, and lastly the importance of trying to make IT, ie your work, rather than MAKING it, i.e. that idea of success. Artists Christine Relton and Tom Marine who work as a pair gave a very entertaining talk about how they are able to make their living and the importance of art fairs as a turning point in their careers, and exhibiting as a collective with other artists at fairs normally reserved for galleries, as well as the need to take risks. They also stressed the need to stay strong in the face of incessant rejection from galleries and the importance of having a good website that includes an artist statement and CV and the value of Open Studio events, and that people do want to buy into you and your lifestyle as an artist. They were incredibly generous with their tips and knowledge. In the afternoon Karen Sherwood from the Cupola Gallery talked of her own journey from fine art graduate to gallery owner and gave quite a revelatory account of the gallery’s perspective. The importance of adhering to each gallery’s submission requirements was stressed, and if they are not on their website, phone and ask for them. The need for professionalism was discussed and making appointments rather than just turning up to discuss the gallery representing you or when delivering or collecting art. The need for consistent pricing across your outlets including your website and galleries was also stressed, even though the latter will take around 50% commission. Emails should be polite and short (not through social media), and she usually requires 4-8 good quality JPG images of no more than 250KB for their server’s sake. Additional information should include title, medium, size, process information and wholesale and resale pricing. Separately you should also include a short statement of around 250 words (not in the body of the email), a separate CV and an attached biography, links to your website and full contact details. Other speakers included Sarah Brown, the curator of exhibitions at Leeds City Art Gallery, Andrew Palmer, the director of Palmer Squared. AIR (Artists Interaction and Representation through a-n, the Artists Information Company was also represented with a short talk, as was the newly formed Artists Union. There was a £500 prize available to attendees willing to pitch a business idea to the speakers. Three had been selected before the event and had planned their pitch but as one had dropped out, the final slot was opened to the floor. A nerve-racking opportunity for sure, but it did not stop Lorain from stepping forward and pitching an idea about opening unused spaces across West Yorkshire to show art. Her great idea and bravery earned her the ear of Stephanie Dieckvoss should she decide to take this idea forward. I was in not a little awe of Lorain, I have to say! It was a great day and we were really well looked after, lunch was spectacular, it was an amazing environment and the Kinder eggs with afternoon tea was a lovely touch. I guess I started the day wondering if I was just mucking about trying to earn my living with my loom. I came away with a greater feeling of legitimacy in my new-found aspirations; there were others trying to do the same, and there are people, structures and organisations who recognise the value in that and want to help, as was demonstrated so fantastically throughout the day.